In modern day weight training routines single handed lifts are seldom included, yet such movements do provide the body with unusual strength-promoting exercises. For example, the forerunner to some of the York training coursed was the Milo system, which in turn was based on Prof. Siebert’s system. This system included one arm presses of various types, but the York method includes the One Arm Military Press, One Arm Slow Side Press (in which one leg is allowed to bend), One Arm Side Press (in which both legs are kept rigid) and One Arm Bent Press (a lift requiring a different technique and plenty of ability). Of course the two lifts illustrated here can be employed as developing movements, or as lifts for record-breaking competition. The top picture illustrates the Stiff Legged Side Press, while the lower photo demonstrates the Slow Side Press in which the leg opposite the lifting arm is allowed to bend as the weigh is pushed overhead. Both side presses illustrated here are excellent for arms, shoulders and back, including the low-back area which is often neglected. Both of these exercises react most favorably upon the waist region, especially the oblique muscles on each side. And though the legs are not involved vigorously, they are activated in coordination with the other body muscles. In doing the regular side press in which one leg is bent, the weight is pulled up to the shoulders using either one or both hands, and spacing the feet comfortably apart. Once the weight is at the shoulder, elbow resting on the hip or side of the body (mostly against the flexed latissimus dorsi muscle), the weight is pushed up while at the same time the body begins to bend towards the opposite side with some leg-bending. The other arm is extended out for balance. 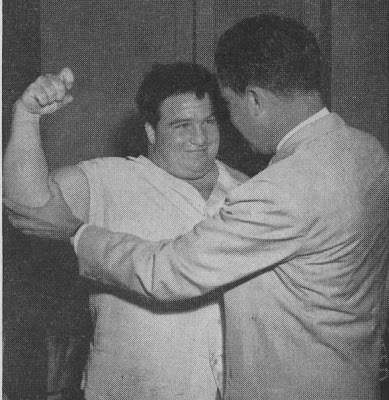 After the weight is pushed to arm’s length overhead, it is returned to the shoulder. It’s not necessary to touch the elbow to the hip this time but keep the lats flexed and stop the weight at this point before shoving it up again. The performance of this exercise is quite similar except both knees are locked and maintained this way. Pushing the weight is accomplished by the arm and bending the body as illustrated in the top picture. This lift is more difficult and requires more practice and ability than the slow side press. 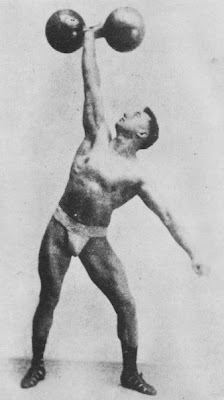 However, initial persistence and practice in mastering the slow side press enables one to acquire the ability to perform this stiff-legged version more effectively. In this lift the lower back and sides of the waist get more exercise than from the previous one – even the legs are stretched and pulled much more strongly than in the previous lift. In any case, both movements have their place in modern-day training, even though it means exercising each side individually, and takes some work to learn the proper form and execution. Use a light weight at first and do 6 to 10 repetitions to get the feel of the lift. Once this is achieved, begin adding weight and perform 5 or 6 repetitions. When eventually moving to limit weights 1 to 3 repetitions can be used. On the other hand, if both versions are to be included in one training session, it is best to warm up thoroughly on the Slow Side Press, increasing the weight gradually while doing 1 to 3 reps until 15 or 20 total reps have been done. Now you’re ready to try the Stiff Legged Version, but keep in mind, it’s easier to do a Slow Side Press than the Stiff Legged Version – at least that’s true for most lifters. 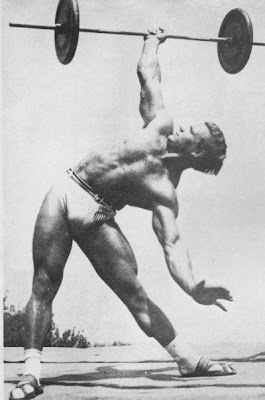 However, once you master the stiff legged variety you may want to try the Bent Press next, a truly remarkable lift that requires patience in training, finesse and athletic ability.